This bank holiday weekend I did something unusual; instead of film marathons and suffering from bum-numbness, I got several breaths of fresh air trekking around Glastonbury. I'd never been before - what a stunning little town! My friend and I arrived on Saturday afternoon and went to The White Spring where the water runs crystalline pure and tastes just as so. While contemplating in this magical little cave, my chakras danced to the beat of a drummer who took advantage of the amazing acoustics and earthy setting. I tasted the most amazing Brazilian steak that night at a place called Hawthorn's which we had to revisit the next night because we'd given it 5 stars; we spent most of the meal talking about the food which we decided was the only sign of the most satisfying dinner out. As we left the restaurant we were pulled down the street by the sound of live blues rock; we bopped a little in the doorway of the pub that was hosting it before we decided to call in for a drink...what an incredible band! The lead singer who was also the lead guitarist had the luxury of selecting a guitar out of the five he had for each song they were about to blow us away with. Someone in the audience asked if she could sing and took the stage for 'Sweet Home Chicago', turns out, it was Suzi Quatro's daughter. Walking up the Tor, I got a healthy clear out; you almost have to use your hands to climb just to ensure that you don't get blown off by the incredibly forceful wind up there. I began the climb with a cold and by the time I'd gotten to the top, my innards felt like they had been pumped with menthol! Walking down the high street that afternoon I was looking around all the beautiful little shops like I'd only just seen the sky for the first time...I was surrounded by Native American treasures and Pagan decoratives and crystals and esoteric books and all of my favourite wonders on one road! Oh to wake up and have that all on my doorstep *sigh* needless to say, I spent a fair bit! It was a sad morning on Monday, knowing that I was going home. We had a meander one last time and ended up discovering a few more delights before getting our bus back to Bristol for the train. We found a shop called Star Child which actually looks like a magical apothecary built into a tree house (the herbalist in me squealed a little) and then we entered The Goddess Temple and the vision of that can only reside in my memory and cannot be described in words and all I can say is that my heart lifted up to the cosmos and my soul felt like it was finally home. I'll go back there one day and write in that Book of Inspirations, Meditate with peace and light a candle to all that is. 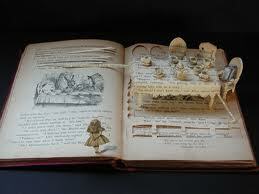 I have plunged feet first into the magic and art of words, words printed neatly onto soft pages and then lifted off again and shaped into quaint little pictures. 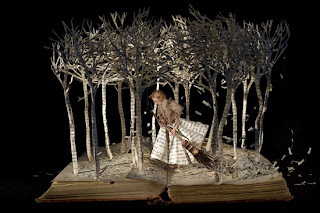 Having discovered paper and book art, I have become completely obssessed and I want to learn how to transform the glorious invention of paper into eye-dazzling decoratives like these by Sue Blackwell. I want to learn how to make paper from scratch, I want to learn how to sculpt it into 3D, craft it into colourful and texturised murials and I want to mould it into one of my favourite things on this planet - the book and then pluck it out again and craft it into still story-book life! ...the other thing that's rekindling my lust for words is a whole new pile of books I've treated myself to, some I should have read a long time ago! 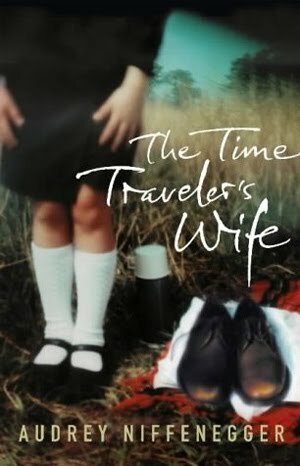 The End of Mr Y, The God of Small Things, The Curious Incident of the Dog in the Night Time, The Help and my favourite so far: The Time Traveler's wife. I love new books and I love it even more when I enjoy each one, knowing that I can add the author to my list of 'ones to watch'...although these freshly printed darlings won't be test dummies for my book sculpture projects!